Every now and then I come across a gem via streaming Netflix. Night Train to Lisbon, directed by Bille August, is one such gem. Inappropriately tagged as a “thriller” it’s really a personal and political mystery that alternates between present-day and revolutionary1970’s Portugal. A present day Swiss classics professor played by a controlled and bland Jeremy Irons rescues a young woman from a bridge suicide. She disappears but leaves behind a small book of history and philosophy that describes people and events surrounding the Portuguese political resistance of the 1970s. Impulsively the professor leaves his job, engrossed in the book, and travels to Lisbon to investigate. The film then alternates between present-day Lisbon and 1970s Lisbon. We get to know the stories of key players as they are now and as they were in 1973 as they tell stories of the “resistance” to the cruelty and torture of the government’s secret police. There’s much to like about this film. Physically we are transported to times and places with which we may have little familiarity. The physical appearance of Lisbon today versus 1973 is communicated in subtle ways. We’re never lost as we alternate between past and present. Most impressive is the cast. 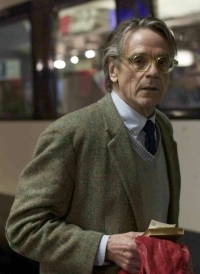 We get to know many characters via the musings, reading, and conversations of Jeremy Irons’ tweedy professor whose impulsive travel and research provide the foundation for the narrative. And what a cast! Charlotte Rampling, Christopher Lee, Bruno Ganz, and Tom Courtenay are the current day — and elderly — embodiments of the young 1970s characters. They are fascinating to watch as they revisit the past in response to the professor’s questions. You can tell this is based on a novel as reading and philosophical musings play such an important role. Maybe that’s one of the reasons I enjoy the movie so much despite the sometimes far-fetched nature of the underlying story line. In the end it’s a pleasure to see an exquisitely photographed and acted adult drama like this. If you’re looking for a respite from superheroes, explosions, and sophomoric humor, check this one out.